Everyone has a story. Even the woman who invented the miracle mop. In Joy, Jennifer Lawrence is the 1995 version of Joy Mangano as we become privy to the beyond hectic journey it took for this now entrepreneur and titan of industry to become such. In these terms, this is a real rags to riches story and would probably be a very compelling one at that if it were simply left to these devices, but in the hands of director David O. Russell (Silver Linings Playbook, American Hustle) it has to be more than that-it has to be mythic almost. There isn't necessarily anything wrong with this approach as a unique or different take on any type of material is always appreciated, but Russell's style is especially effective with some stories while not always finding it's rhythm with others. Joy lands somewhere in the middle of this scale as certain aspects of our titular characters life service Russell's frantic style well while other times it seems to be fighting with the tranquility that the film so desperately craves. In a word, the film is relentless. And to a certain extent it should be in order to give audiences a real sense of what this character had to overcome to get to where she is today, but it is always key for journeys such as this to provide moments of calm reflection that, again, help to give audiences a sense of scope. Here, these moments are treated as flurries of flashbacks or mounting issues that are proclaimed one after another in sometimes painfully awkward dialogue. This technique works to a certain extent given there are moments when the relentless clawing and nagging of every supporting character in the movie ceases and something good is actually allowed to happen to Joy without them mingling and messing things up, but these are too few and far between. The real issues arise when it became clear we, as an audience, want to dig deeper into the psyche of our main character than the actual film does. 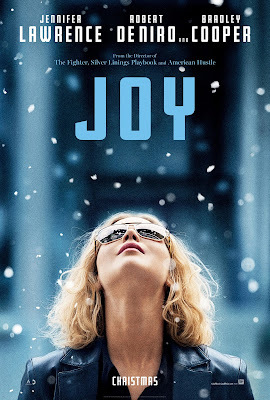 Why does Joy continue to allow her family to pull her down? That Joy, unlike say Russell's The Fighter, never digs into the reasons as to why Joy can't leave these thwarted and painful relationships behind is ultimately what makes the project feel more barren than it wants to be. Joy (Jennifer Lawrence) comforts her daughter, Christie (Gia Gadsby), after a long day at work. A myth, by definition, is a traditional or legendary story that usually concerns a being, hero, or event that deals in a scenario with or without a determinable basis of fact or natural explanation. Myths typically include the likes of deities or demigods in order to explain a practice, rite, or phenomenon of nature. Sticking with this analogy Joy is clearly our hero as she is close to being the only reasonable person in the entire film which, in itself, is enough to be considered unnatural. Joy would certainly be classified as a deity or demigod given one would have to be as much in order to put up with all she does ultimately explaining the phenomenon that makes a random group of people connected only by genetics remain together over the course of many years despite their inherent differences being more than enough to prove their paths should have diverged long ago. Let us not forget that Hades and Loki are also deities, but could not be further from the noble and heroic persona we typically equate with such titles. If Joy is somewhere along the lines of Achilles or Hercules in this story, then her family are too, by default, Gods and would certainly line up more with the likes of Hades than Achilles. In the beginning we are introduced to Joy as a young girl via the narration of her Mimi (Diane Ladd) who tells us the young girl always enjoyed creating things and that she was never the type of girl who needed a prince to complete her fairy tale. Of course, we all grow up, cease to exist in our own fairy tales, and deal with the hardships we as well as life brings down upon us. Fast-forward to 1995 and Joy is divorced from aspiring singer Tony Miranne (Édgar Ramírez) who still lives in the basement of their house (that is falling apart), she's trying to raise their two children while dealing with her mother, Terry (Virginia Madsen), who never leaves her bed and seems to suffer from some kind of anxiety while also being unhealthily obsessed with a soap opera. Mimi is more or less left to help raise the kids as Joy is the only one in the house with a steady job and on top of that her father, Rudy (Robert De Niro), tells his daughter he's moving back in after it hasn't worked out with his latest girlfriend. And that's not even including her half-sister, Peggy (Elisabeth Röhm), who's been gunning for Joy her entire life. Needless to say, things are poised to reach a breaking point. The inevitable comes soon after Rudy meets a new woman, Trudy (Isabella Rossellini), who is wealthy thanks to her late husband. One day, after taking Rudy and his daughters out on her boat in which red wine is spilled on her expensive deck Joy finds inspiration for her signature invention. Asking Trudy to invest in her company Joy puts her head down and bulls forward, unable to ignore her Mimi's hopes and her own dreams that lambaste her for giving up on her dreams. For the first half hour or so, Joy is firing on all cylinders as Russell sets up his world, his characters, and the story he is going to be using both for. I mean literally very literally when I say there's not a minute in between De Niro's character arriving and him smashing plates and pots after getting into an argument with his ex-wife. Russell utilizes the soap opera (starring Susan Lucci and Maurice Benard) to which Terry is addicted as something of a framing device in order to both convey the potential melodramatic pitfalls of the story as well as a way to better connect Joy's nightmares of slipping into the same trappings as her parents. It's an interesting choice and it works effectively for a period of time, but then is abruptly abandoned. Fortunately, this is due to the fact the film is moving in a much more intriguing direction as Tony suggests a friend he once worked with as a potential contact for selling Joy's mop to the masses. It turns out that friend is employed by the slightly new, but budding cable channel that is QVC. There, Joy is introduced to Neil (Bradley Cooper) an executive who chooses what products the channel will sell on air. For the first time in the film, outside of Dascha Polanco's Jackie who was Joy's childhood best friend, it feels as if someone is on our protagonist's side. Neil is still very much a business partner to Joy, but rather than tearing her down he is the first one who simply treats her with respect. This changes the tone of the film considerably, the atmosphere is lighter, the piano heavy score becomes something flightier and for the first time we feel the payoff of what Russell was building towards. Russell and writing partner Annie Mumolo (Bridesmaids) make Joy's family so toxic and so aggravatingly demeaning that it almost makes zero sense as to why this woman would put up with such treatment for so long, but when the film crescendos in this moment of success we feel the weight of it. It's substantial. Too bad the film still has forty-five minutes left with which it will use only to once again tear our hero down. 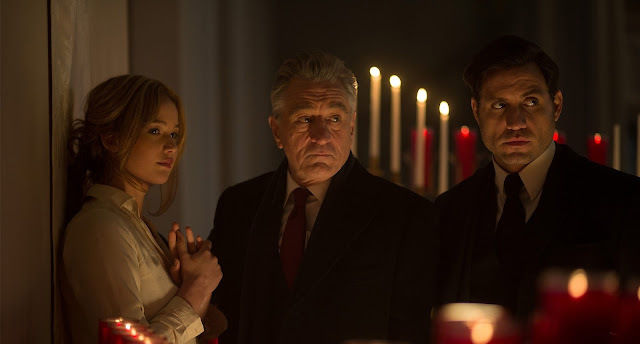 Joy is bombarded by the conflicting advice of her father (Robert De Niro) and ex-husband (Édgar Ramírez). It is in these last forty-five minutes that the exceptional quality of Jennifer Lawrence's performance comes through. Were the film to have given us one or two more scenes following this euphoric moment then this film would be receiving a higher recommendation, but that it goes back and essentially repeats the same beats one more time to drive home it's point of just how much Joy put up with until she finally had to bring the hammer down makes the overall experience more disjointed than it should be. As Joy though, Lawrence truly is terrific. She becomes this trapped woman, desperate for an opportunity to fulfill this position of great destiny her Mimi has always set her up for. As mentioned prior, we wonder why this woman would stand to put up with so much, why she feels the need to stay connected with these people who do nothing but take from her without giving anything back and while the movie never finds a way to explain such things we can see hints of what the reasons might be in Lawrence's performance. We can see the inability to blame anyone else, this destiny she seeks being her sole responsibility to fulfill, but not before making sure everyone else is happy and settled first. That Joy gave up going to college after being valedictorian for her parents or that she got a minimum wage job so that Tony might pursue his singing career tell us the lengths she'll go to, but Lawrence shows us through the way she carries herself, her defeated tone with which she speaks, and even the way she hides herself as much as she can in her plain outfits. The only downfall to the performance is that Lawrence, at twenty-five, is playing Mangano when she was thirty-nine. While Lawrence is mostly believable, there are times when the inability to mature her natural state makes it clear it's not as progressed as it should be for this character's mindset. With everything that is thrown at Joy you expect her to be of a certain age and that Lawrence is not discredits the toll her family has taken on her slightly. And so, Joy is a film that both has a lot going for it while at the same time seems to be fighting with itself to decide the best way to convey it's story. It’s a problem the principal family Russell is documenting is struggling with as well. Through Joy, through Tony and even through Rudy there can be seen glimmers of hope and of humanity, but at the same time there are these elements to each, these outside factors that are pulling at them, holding them back and ultimately making them less of a success than they might otherwise be. The biggest qualm with this depiction of a dysfunctional family is that we never come to really understand why these people are the way they are. Joy is constantly being told what she is or who she’s not, but it never gives us any clear indication of what right these characters have to make such assumptions or to ask such questions. We never understand fully why Joy’s mother is so afraid to get out of bed, why her father wanders from one woman to the next, or why her sister thrives on Joy’s failure. Were Russel to have spent more time digging into these aspects rather than creating surrealist devices or larger metaphors that make the film feel other-worldly we might not mind spending as much time with these people as we do. As it is though, Joy simply doesn't spend enough time in the right spots of Mangano's life to be truly effective.